Just signed up for a 10 mile race, or do you have one in your sights? I’ve got a training plan to help you out! This 10 Mile Race Training Plan for Beginners is what you need to get across the finish line on race day. I first wrote this training plan because I was throwing around the idea of signing up for the Soldier Field 10 Mile race in May of 2015. The race was about 12 weeks away, so I wanted to throw together a basic training plan to use as a baseline for the minimum amount of training I thought I’d need. 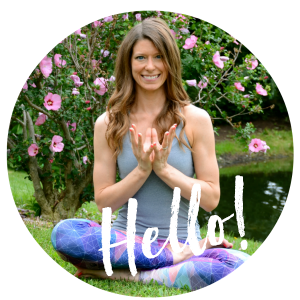 Then I thought, heck, I’m a certified running coach, I should throw my 10 mile race training plan up on the blog so I can share it with everyone! I designed this training plan as a basic training plan for anyone wanting to train for a 10 mile race, primarily aimed at beginners. The assumption here is that you’ve worked up to running, walking, or run/walking a 5K and will be able to work through a 3.5 mile long run the first week. If you’re not there yet, just take a few weeks to build up your base and work up to that 5K distance. The 10 mile race training plan includes speed work on Thursdays but you could change that speed work for an easy run. Any speed work workout that’s appropriate for beginners or intermediate runners would do, but I’m suggesting an easy workout: 2 minute intervals. After a good warm up, you run hard for two minutes, at about 70 to 80% effort. Then, you jog for two minutes. Repeat several times, leaving about five minutes for a jogging cool down. Need help figuring out your cross training? 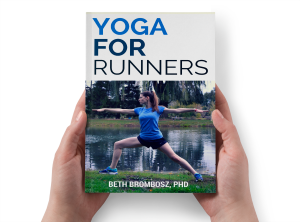 I strongly suggest yoga as cross training for running! It’s a great way to gain strength and build flexibility (so you’re not as sore after your runs and you run with good form). Plus, it will help you become a mentally stronger runner, which will definitely help you on race day. Finished with this 10 mile race training plan, or looking to take the next step? 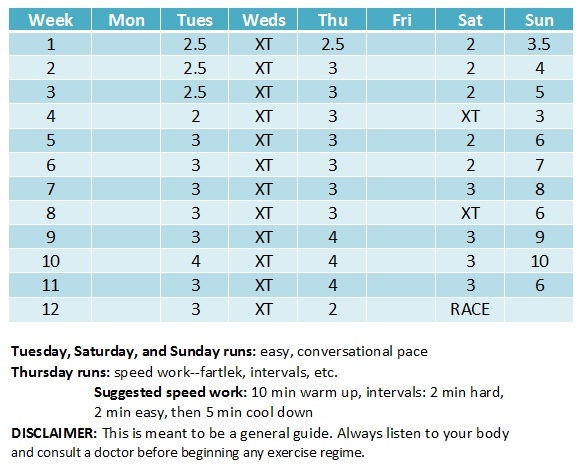 If you wanted to, you could even add on a few weeks and use this as a half marathon training plan, or follow this exactly if you think you could push through the last 5K of a half marathon without having run more than 10 miles during training. The adrenaline will really carry you through on race day, so feel free to give it a try! This is a great plan! I love your plan for intervals. I am always at a loss for how to manage speed work. I ran a ten mile race last year but it was part of a 16 mile training run, so I ran 3 miles before and 3 miles after, so my impression of that race distance is a bit skewed. I’d like to find some more to run next year, as I’m planning to train for the same marathon again this year and will be focused on longer distances over the summer. Unfortunately there aren’t many in my area. It’s definitely an underappreciated distance! I like weirdo race distances. I did the LakeFront 10 miler last year but can’t do it this year because I’ll be in PGH for Caitlin’s wedding. This looks like a solid plan! Good information for beginners. Thanks for sharing. I’ve a handful of half marathons, but will be starting my training for my first 10 miler this week. My weirdest distance was a 7k I did in Atlantic City. Great training plan! Oh! So fun to get training! I can’t wait to get outside this spring and run! My first (and only) half marathon was the Chicago Rock n’ Roll Half and I fell in love with the RnR seiers! It’s a GREAT first half marathon experience, I’m excited for you!!! what is XT on Wednesdays?